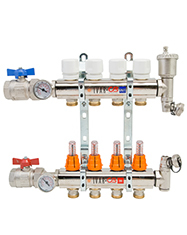 The CB Supplies manifold, available with 1″ or 1 1/4″ headers, is ideal for hydronic and regulation balancing of radiant floor heating systems. It comes complete in the box eliminating the confusion with necessary add-on parts. It is also assembled and mounted on brackets and therefore can go from the box to the wall making its installation simple and fast. Each manifold is equipped with supply and return isolator valves on which are mounted two thermometers for supply and return temperature monitoring. The supply header is equipped with flow gauges simplifying the system calibration. The return header is controlled by manual shutoff valves or can be coupled to electro thermal actuators for the automatic control of the environment temperature. It is also equipped with two automatic air flow vents for air purging. The fill and purging ports are equipped with ball valves simplifying these two operations. The forged body of the manifold is manufactured of UNI EN 12165 brass and will withstand 145 PSI and 100°C. All o-rings are EPDM.